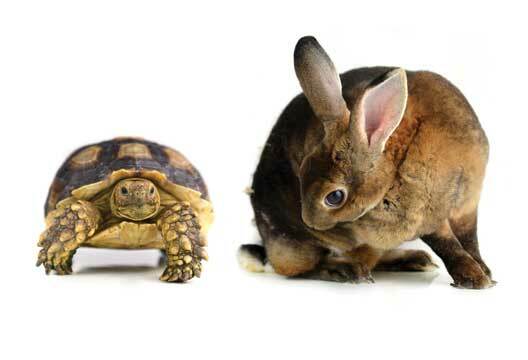 Is slowness the essence of knowledge? Eloise Stark looks at whether ‘slow and steady wins the race’. Generally we associate speed with positive outcomes. Being ‘fast’ is perceived as good; being ‘slow’ is perceived as bad. Quiz shows demonstrate the benefits of fast thinking – speedy responses win prizes, while hesitation costs points. In most careers, including academia, speed is valued. But speed isn’t everything, and slowness may in fact be more beneficial to us in many circumstances. In our age of snap judgements and instant opinions, slowness and deliberative contemplation may be more important than we realise. In his 2011 book Thinking Fast and Slow, Daniel Kahneman suggested that the human mind consists of two competing systems. His central hypothesis is a dichotomy between two modes of thought: ‘System 1’ is fast, instinctive and emotional. ‘System 2’ is slower, effortful, more deliberative, conscious, and more logical. To illustrate the two, imagine you see an angry face in a crowd – you will instantly focus on that individual because your brain perceives a threat and works quickly to identify it in order to keep you safe. This is an example of the ‘fast’ system. Our brains are hardwired to respond quickly to certain cues in the environment, and this helps us to survive. In the battle of the popular science books, Malcolm Gladwell’s 2007 Blink exalts the virtue of ‘thinking without thinking’. His central idea is that spontaneous decisions are often as good as, or superior to, carefully planned and considered ones. Gladwell’s acclamation for snap judgements and first impressions has many parallels with Kahneman’s concept of ‘fast’ thinking. Yet there are many situations when our brains take longer to complete tasks – using Kahneman’s ‘slow’ system. For instance, complete this sum: 498 + 813. I bet you really had to think – that is your ‘slow’ system which allows you to process more tricky situations. And as I will demonstrate here, slowness is vital to many situations, and may also provide a hallmark of a healthy brain and mind. In 1986 there was uproar when a McDonald’s fast food restaurant was scheduled to open in the picturesque Piazza di Spagna in Rome. This was led by a man called Carlo Petrini, who subsequently inaugurated the ‘slow food’ movement. In contrast to fast food, diners were encouraged to source food from sustainable sources, but also to increase gastronomic pleasure by eating in a slow, relaxed way. Taste and pleasure of food are linguistically linked to slowness, such as in the phrase ‘to savour’ what you are eating. In keeping with the mantra of the ‘slow food’ movement, there is evidence that slower eating leads to greater satiety, and greater pleasure (Andrade et al., 2008). In contrast, fast eating can lead to obesity, and healthier individuals tend to engage in slower eating. Given the worldwide obesity epidemic, such findings may be significant. There are many brain processes that could be labelled ‘slow’ processes, but one that stands out is cognitive reappraisal. Reappraisal is defined as the regulation of inner states, primarily emotions, through modification of the original reaction. Emotions prompt rapid responses within us. Just like ‘fast’ thinking, emotions involve changes to multiple response systems: behavioural, experiential and physiological. An emotion generally has an identifiable impetus or trigger, either in the external environment or internally, such as a thought. The stimulus that prompts the response may have intrinsic affective properties, such as an aversive shock, or may have a learned emotional value. If emotions prompt rapid responses, cognitive reappraisal is the ability to more slowly re-evaluate our initial reaction. This slower process allows us to regulate our own emotions and respond more appropriately to situations. For instance, imagine we are walking down the street and we pass a friend. We lift our arm and wave to them and say hello, but they simply carry on walking as if they don’t know us. Our first, fast, reaction may be to suppose that they deliberately ignored us, perhaps prompting emotions such as anger or sadness, which can spiral into a negative mood. However, if we are able to reappraise the situation more slowly, and come to a more balanced view, we may be able to avoid the negative emotional consequences. Perhaps he just didn’t see us? Perhaps he was having a bad day and didn’t feel like talking? Reappraisal allows us to focus on the facts, considering more balanced opinions and thereby regulating our emotions. There is good evidence that the slow process of cognitive reappraisal can be good for us. Successful reappraisal lowers measures of negative emotions and is linked with adaptive long-term improvements in everyday functioning (Dillon & Labar, 2005). Cognitive reappraisal may also be a crucial factor within cognitive behavioural therapy, or CBT. Its importance is demonstrated by the finding that reappraisal alone has been found to mediate the effects of individual CBT for social anxiety (Goldin et al., 2012). Crucially, individual differences in the ability to regulate one’s emotions using processes such as cognitive reappraisal might be related to both normal and pathological variations in wellbeing (Ochsner & Gross, 2005). The role of cognitive reappraisal variations in mental illness is an interesting route still to follow. The distinction between fast and slow thinking has yet to be applied explicitly to the realm of psychiatry, yet many forms of psychopathology revolve around repeated failures to adaptively regulate our emotional responses. A deficit in ‘slow’ thinking processes may underlie these difficulties, and slowness may even be a hallmark of the ‘healthy’ brain (Kringelbach et al., 2015). In psychosis, a disorder where people lose touch with reality, recent research has also pointed towards slowness and ‘slow’ thinking as a marker of recovery. In a 2015 study Philippa Garety and colleagues found that helping people with persecutory delusions to slow down their thinking, and be aware of ‘fast’ thoughts, reduced their levels of paranoia. Their patients stopped instantly jumping to conclusions in keeping with their persecutory beliefs, and were able to challenge them. Slowness may here too be a route to recovery and could provide a cognitive index to help clinicians to work out when patients are getting better. Garety and colleagues also suggest that slowness should be a prime target for cognitive mechanisms of change in delusions. New therapies may greatly benefit from inducing ‘slow’ thinking in patients. As many psychiatric illnesses and substance-use disorders involve impulsivity and compulsivity, interventions that aim to induce slowness may become more widespread. At the heart of the slow science movement is a strong opposition to performance targets, and an emphasis instead upon slow, methodical processes and quality-driven research. Proponents such as Uta Frith argue that the current academic environment encourages scientists to strive for fame, promotions and tenure by propelling their results and reviews into print. However, they argue that the emphasis upon productivity is too aggressive, leading to mistakes being made and a lack of quality. The pressure to publish facing many academics is said to drive down the quality of research. Daniel Sarewitz argues that large bodies of published scientific research are unreliable or of poor quality, citing a ‘compulsion’ to publish as a causal factor. Indeed, the mantra ‘publish or perish’ appears to have become a widespread marker of the academic lifestyle. There is even statistical evidence that many low-powered studies yield more statistically significant results, suggesting that the most ‘productive’ researchers may in fact be the least reliable (Lakens & Evers, 2014). The virtues of slowness have also been explored within neuroscience, where slowness of thought has been found to be an important property of brain function. This work directly translates Kahneman’s fast and slow systems into tractable brain mechanisms and dynamics. For instance, neuroimaging studies have consistently demonstrated that the correlations in activity between brain regions evolve over time (Chang & Glover, 2010). Time is therefore an important property of the brain’s dynamics; spatial patterns are formed, dissolved, and reformed over time. Both rapidity and slowness are intrinsic properties of the human brain. Research has further shown that the global phase synchrony of the time-series of brain activity evolves over a characteristic ultra-slow timescale (< 0.01 Hz). The brain at rest has a steady temporal variation in the formation and dissolution of multiple communities of harmonised brain regions. The neuroscience of slowness has been studied indirectly with regard to cognitive reappraisal, a typically slow cognitive process that occurs often as a response to initial ‘fast’ emotional reactivity. One meta-analysis of neuroimaging studies of cognitive reappraisal combined 48 fMRI studies involving the downregulation of negative emotion in a slow manner (Buhle et al., 2014). They found that reappraisal appeared to occur by prefrontal and parietal regions exerting changes in lateral temporal areas associated with semantic and perceptual representations. By actively altering the mnemonic representation of the event, the individual is able to alter the emotional significance of the event. For example, someone who has seen the horrific aftermath of a motor vehicle accident may be able to tell themselves ‘that’s not blood, it’s just ketchup’, therefore changing the valence of the triggering mental image. Looking back at the results of Garety’s team, with reference to patients experiencing delusions, it would be interesting to study the neural dynamics underlying their initial, fast, paranoid thoughts, and their later, slow, reasoning. My own research into parenting has benefited greatly from considering how slow and fast thinking operate together to achieve optimality in both brain and behaviour. We know that baby cues, such as a cute baby face or a piercing distress cry, operate to attract adults’ attention rapidly (Kringelbach et al., 2008). This is a key example of the ‘fast’ system, where an environmental stimulus related to a helpless infant prompts a rapid orienting to the baby. This fast response is even substantiated in the brain, with neural activity at 140 ms, too fast for conscious appraisal, in the reward-related region of the orbitofrontal cortex. Interestingly, we find that if the typical ‘cute’ infant face is disturbed with a craniofacial deformity such as cleft lip, this burst of orbitofrontal activity is absent (Parsons et al., 2013). Whereas in cognitive reappraisal, the initial ‘fast’ response may need altering, in the context of infants our fast response is beautifully timed to coordinate the following slowly mediated caregiving behaviour. The fast burst of activity in response to a cute infant face or a distress cry may bias the adult’s attentional resources to prompt action immediately, thereby securing the survival of the baby by making it the prime focus of the caregiver. At this point, however, slow processes take over and are fundamental to the flourishing parent–infant relationship. These slow processes involve mentalisation – the ability to treat an infant as an independent psychological agent and guess their needs and desires – and emotional scaffolding – the appropriate regulation of infant emotions. It is these appraisal behaviours that require slower processing but provide the much-needed developmental support for the infant. Such processes are also substantiated in the brain, spanning a network of regions involving capacities such as emotion, pleasure and social interaction. Becoming a parent can at first be daunting, but the interplay between slow and fast processes in parenting demonstrates how we are well equipped for the role (Kringelbach et al., 2016). As the ‘slow movement’ advocates a cultural shift towards slowing down life’s pace, so does the evidence. Slow processes, be it eating, cognitive reappraisal or slow thinking in the context of psychiatric disorder, are beneficial to us. Slowness may even be an index of recovery in mental health. Speed is evidently important in many contexts. Quick reactions and instinctive responsiveness aid survival. But we also have a subsequent ‘slow’ response, which is conscious and deliberative, and may be beneficial for more complex social interactions and moral emotions. Perhaps ‘fast’ and ‘slow’ thinking are really two sides of the same coin – intrinsically related, but with their own independent virtues. In our fast-moving society that frequently prioritises speed, the importance of slowness should not be forgotten. How can we apply slowness to our own lives? Well, the ‘slow science’ movement encourages scientists to halt multitasking in favour of slow, steady methodical processes. It calls for increased time to think and muse about the scientific questions we pursue. The manifesto says that society should give scientists the time they need, but more importantly, scientists must take their time. Andrade, A.M., Greene, G.W. & Melanson, K.J. (2008). Eating slowly led to decreases in energy intake within meals in healthy women. Journal of the Academy of Nutrition and Dietetics, 108(7), 1186–1191. Buhle, J.T., Silvers, J.A., Wager, T.D. et al. (2014). Cognitive reappraisal of emotion. Cerebral Cortex, 24(11), 2981–2990. Chang, C. & Glover, G.H. (2010). Time-frequency dynamics of resting-state brain connectivity measured with fMRI. Neuroimage, 50, 81–98. Dillon, D.G. & Labar, K.S. (2005). Startle-modulation during conscious emotion regulation is arousal-dependent. Behavioural Neuroscience, 119, 1118–1124. Garety, P., Waller, H., Emsley, R. et al. (2015). Cognitive mechanisms of change in delusions. Schizophrenia Bulletin. 41, 400–410. Goldin, P., Ziv, M., Jazaieri, H. et al. (2012). Cognitive reappraisal self-efficacy mediates the effects of individual cognitive-behavioral therapy for social anxiety disorder. Journal of Consulting and Clinical Psychology, 80(6), 1034–1040. Kringelbach, M.L., McIntosh, A.R., Ritter, P. et al. (2015). The rediscovery of slowness: Exploring the timing of cognition. Trends in Cognitive Sciences, 19(10): 616–628. Kringelbach, M.L., Stark, E.A., Alexander, C. et al. (2016). On cuteness: Unlocking the parental brain and beyond. Trends in Cognitive Sciences, 20(7): 545–558. Lakens, D. & Evers, E.R. (2014). Sailing from the seas of chaos into the corridor of stability: Practical recommendations to increase the informational value of studies. Perspectives on Psychological Science, 9(3): 278–292. Ochsner, K.N. & Gross, J.J. (2005). The cognitive control of emotion. Trends in Cognitive Sciences, 9, 242–249. Parsons, C.E., Young, K.S., Mohseni, H. et al. (2013). Minor structural abnormalities in the infant face disrupt neural processing: A unique window into early caregiving responses. Social Neuroscience, 8, 268–274. Sarewitz, D. (2016). The pressure to publish pushes down quality. Nature, 533, 147.